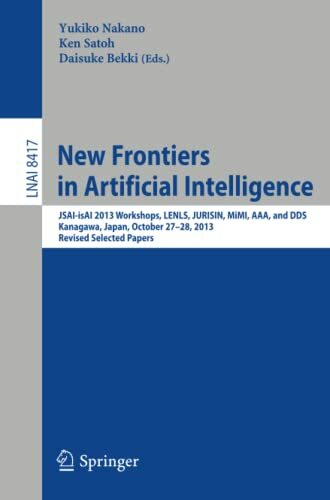 [PDF] New Frontiers in Artificial Intelligence: JSAI-isAI 2013 Workshops, LENLS, JURISIN, MiMI, AAA, and DDS, Kanagawa, Japan, October 27-28, 2013, Revised ... / Lecture Notes in Artificial Intelligence) | Free eBooks Download - EBOOKEE! Description: This book constitutes the thoroughly refereed post-conference proceedings of the JSAI-isAI 2013 Workshops LENLS, JURISIN, MiMI, AAA, and DDS which tool place on October 2013, in Japan. The 28 contributions in this volume were carefully reviewed and selected from 48 submissions. LENLS (Logic and Engineering of Natural Language Semantics) is an annual international workshop on formal semantics and pragmatics. LENLS10 was the tenth event in the series, and it focused on the formal and theoretical aspects of natural language. JURISIN (Juris-Informatics) 2013 was the seventh event in the series. The purpose of this workshop was to discuss fundamental and practical issues for jurisinformatics, bringing together experts from a variety of relevant backgrounds, including law, social science, information and intelligent technology, logic,and philosophy (including the area of AI and law). MiMI (Multimodality in Multiparty Interaction) 2013 covers topics as follows interaction studies, communication studies, conversation analysis, and workplace studies, as well as their applications in other research fields. AAA (Argument for Agreement and Assurance) 2013 focused on the theoretical foundations of argumentation in AI, and the application of argumentation to various fields such as agreement formation and assurance. DDS (Data Discretization and Segmentation for Knowledge Discovery) 2013 discussed segmentation methods for various types of data, such as graphs, trees, strings, and continuous data, and their applications in the areas of Machine Learning and Knowledge Discovery. 2017-12-09[PDF] 'New Applications of Artificial Intelligence' ed. by Pedro Ponce, et al. No comments for "[PDF] New Frontiers in Artificial Intelligence: JSAI-isAI 2013 Workshops, LENLS, JURISIN, MiMI, AAA, and DDS, Kanagawa, Japan, October 27-28, 2013, Revised ... / Lecture Notes in Artificial Intelligence)".